Unprecedented assembles evidence that carbon emissions from fossil fuels are pushing humankind to unprecedented crises. Weather events are becoming more severe. Heat waves, droughts, wildfires, storms are more frequent. Ice caps and glaciers are melting. Sea levels are rising. Oceans are becoming more acidic. 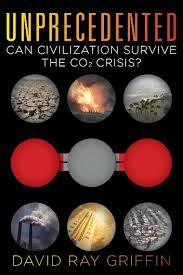 A professor emeritus of philosophy and religion, David Ray Griffin discusses in his book, Unprecedented: Can Civilization Survive the Co2 Crisis? (Clarity Press, 2015), human-caused climate change from economic, moral, political, religious, philosophical and environmental perspectives. Griffin concludes that humankind cannot avoid suffering damaging consequences from two hundred years of industrial capitalism, one hundred years of automobile culture, and seventy-five years of air travel and corporate agriculture. But we are not doomed. So long as most fossil fuels are left in the ground and carbon emissions are cut by eighty percent in the next two decades, human civilization will survive. Griffin writes that technology is coming to our rescue. Electricity from solar can now be produced for less than the cost from fossil fuels. Wind and solar power can be produced locally in many places around the planet. Solar alone could produce many time more energy than humankind now uses from all sources. The problem is that capital, especially in Canada and the U.S., is so heavily invested in fossil fuels. In Canada, BC has a carbon tax. But a carbon tax of a few cents a gallon has little impact. Meanwhile BC provides oil, natural gas, and coal companies with subsidies and tax breaks. It actively promotes exports of fossil fuels. This year, Ontario and Quebec announced plans to expand their participation in cap and trade. But cap and trade does not fund alternatives to fossil fuels. It doesn’t even require the worst polluters to reduce emissions. It allows them to continue emissions so long as they purchase carbon credits. In poorer countries–and here in BC–agricultural land is being lost as cap and trade speculators assemble agricultural land, plant trees and then sell carbon credits. In the U.S., the Obama Administration acknowledges the threat of climate change but does little. Some States have actively encouraged the development of wind and solar power. With little or no corporate investment, solar power in the U.S., China, Germany and other countries is expanding faster than other sources of electricity. But that is not fast enough to avoid unprecedented catastrophe. Initiatives will not come from corporations. They are too dependent on profits from fossil fuels. Initiatives will have to come from below, from communities, cooperatives, youth, academics, workers, the poor, unions, religious groups, environmentalists, candidates for political office, and electorates. With deliberate, concerted public action, Griffin insists that fossil fuels can be kept in the ground and replaced with wind and solar power in less than two decades. This article was posted on Friday, May 15th, 2015 at 2:45pm and is filed under Book Review, Capitalism, Climate Change, Corporate Globalization, Oil, Gas, Coal, Pipelines.